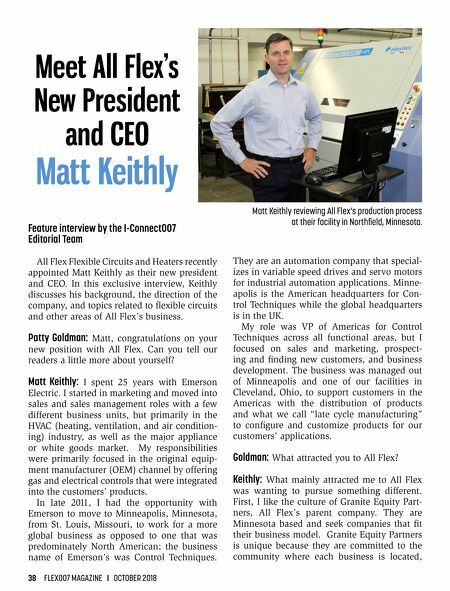 38 FLEX007 MAGAZINE I OCTOBER 2018 Feature interview by the I-Connect007 Editorial Team All Flex Flexible Circuits and Heaters recently appointed Matt Keithly as their new president and CEO. 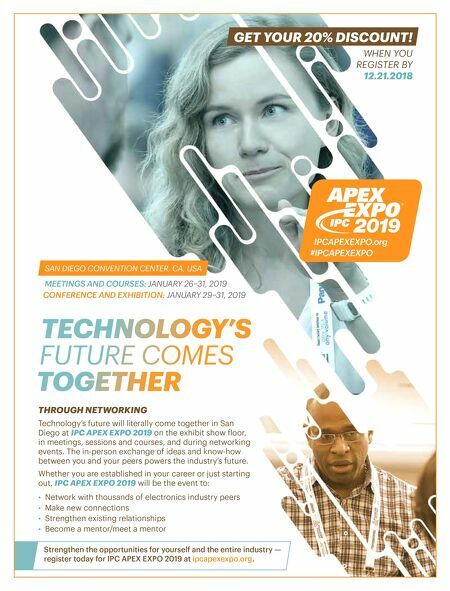 In this exclusive interview, Keithly discusses his background, the direction of the company, and topics related to flexible circuits and other areas of All Flex's business. Patty Goldman: Matt, congratulations on your new position with All Flex. Can you tell our readers a little more about yourself? Matt Keithly: I spent 25 years with Emerson Electric. I started in marketing and moved into sales and sales management roles with a few different business units, but primarily in the HVAC (heating, ventilation, and air condition- ing) industry, as well as the major appliance or white goods market. My responsibilities were primarily focused in the original equip- ment manufacturer (OEM) channel by offering gas and electrical controls that were integrated into the customers' products. In late 2011, I had the opportunity with Emerson to move to Minneapolis, Minnesota, from St. Louis, Missouri, to work for a more global business as opposed to one that was predominately North American; the business name of Emerson's was Control Techniques. They are an automation company that special- izes in variable speed drives and servo motors for industrial automation applications. Minne- apolis is the American headquarters for Con- trol Techniques while the global headquarters is in the UK. My role was VP of Americas for Control Techniques across all functional areas, but I focused on sales and marketing, prospect- ing and finding new customers, and business development. The business was managed out of Minneapolis and one of our facilities in Cleveland, Ohio, to support customers in the Americas with the distribution of products and what we call "late cycle manufacturing" to configure and customize products for our customers' applications. Goldman: What attracted you to All Flex? Keithly: What mainly attracted me to All Flex was wanting to pursue something different. First, I like the culture of Granite Equity Part- ners, All Flex's parent company. They are Minnesota based and seek companies that fit their business model. Granite Equity Partners is unique because they are committed to the community where each business is located, Meet All Flex's New President and CEO Matt Keithly Matt Keithly reviewing All Flex's production process at their facility in Northfield, Minnesota.